This was the list for two weeks. I am starting to get more reading time as the house repairs have taken a slow down and now the to do list are a bunch of things that cost a little more than paint! Maybe I will catch up some ground on my Goodreads Challenge! Looks like your still getting more reading done than I am. LOL. Have a great week. I'm glad that your projects list is getting smaller. You still got lots of reading done. 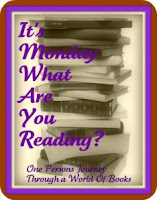 Come see what I read last week at Inside of a Dog. Happy reading! I finished book 2 in Jamie Brenner's Gin Lovers serial this weekend. I'm hoping to finish I've Got Some Lovin' to Do by Julia Tracey this week. After that, Geoducks Are for Lovers by Daisy Prescott - I started it and it's cute, but I want to really dig in and get past chapter three. After that, who knows? I'm studying for the GRE so my reading time is pretty limited right now. Wow on how many books you read last week. The Widows of Braxton County sounds good to me.